With a pair of wins last week, the Fernley High School girls basketball team kepts alive its hopes of earning a seed in the top three for the 3A North Region Tournament later this month. 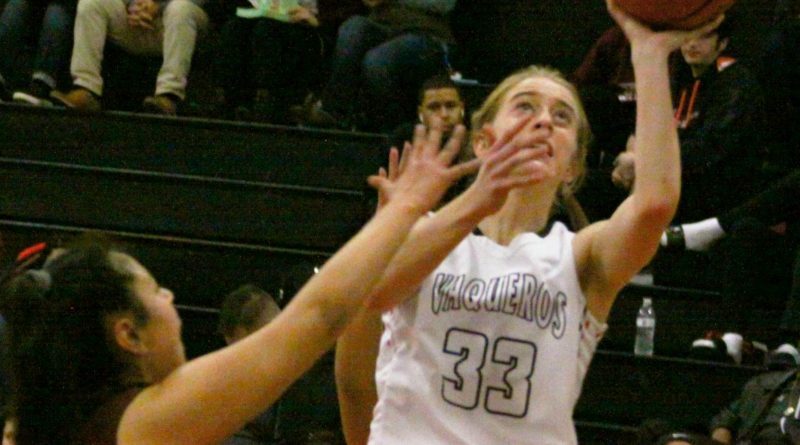 The Vaqueros defeated Sarks 63-33 last Tuesday, then beat North Valleys 60-24 last Thursday. The wins moved them to 9-5 and in sole possession of fourth place in league play, just one game behind third-place Lowry, which they will host in the final week of the season. Before then, the Vaqueros will take the court twice this week as they continue their quest for a top three finish. The Vaqueros host Truckee at 6 p.m. Wednesday and South Tahoe at 1 p.m. Saturday. Truckee defeated the Vaqueros in the teams’ first meeting and enters Wednesday’s game a half-game at 8-5 in league play, while North Valleys is 3-11 and is on the verge of being knocked out of contention for a tournament berth. Against Sparks last Tuesday, the Vaqueros outscored the Railroaders 26-7 in the second quarter to take command of the proceedings and rolled to the win. Eight players scored in a balanced attack for Fernley, with all eight scoring between six and nine points, led by Jaiden Sullivan, Katelyn Bunyard and Olivia Victor, who all scored nine. Thursday, the Vaqueros rolled from the opening of the game, leading 22-7 after a quarter and 40-14 at the half. Sullivan led another balanced attack with 11 points, while Celeste Condie added nine and both Erica Kingston and Bunyard scored eight. “All the girls played tough and together and shared the ball really well,” Rogers said.